At Inpriva, we offer a HIPAA-compliant messaging system to support the secure collaboration required by public health services, social services, judicial systems, and behavioral health specialists, among others. Verified Digital Identity – all users must have their unique identity verified and authenticated before they can access our internal messaging system. A Built-In CCDA Viewer – our direct webmail client includes a CCDA, XDM, and XML viewer. This allows you to see these documents in a readable, online form. 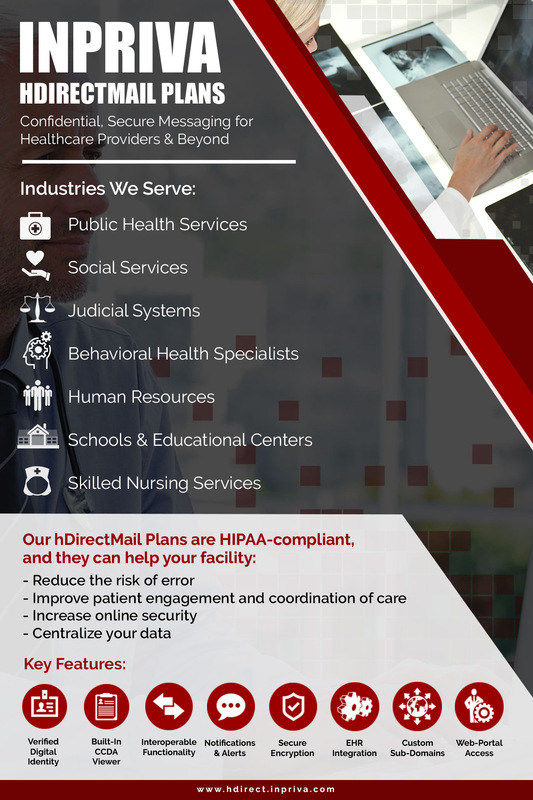 Interoperable Functionality – with our hDirectMail plans, you can connect to the DirectTrust Accredited Network where you’ll find hundreds of thousands of verified Direct Addresses. Notifications & Alerts – easily send notifications to standard email addresses to alert your team members that direct messages have been received. Secure Encryption – all message sent with our hDirectMail plans use industry-standard encryption technologies, so you never have to worry about an unauthorized party being able to read your private messages. Since each of our plans is encrypted using SSL technology, only the addressed recipient can access the message and read it. EHR Integration – if your medical facility currently uses electronic health records, our mail plans can be easily be integrated with them. Custom Sub-Domains – each of our customers is given a free sub-domain to use so other companies and healthcare professionals can easily find you in our web portal. Custom domains are also available upon request. Web-Portal Access – with our hDirectMail plans, you can access your account from any web-enabled device without going directly through your email client. Start your hDirectMail plan today for just $99 a year or visit our contact us to learn more about our plans and pricing.